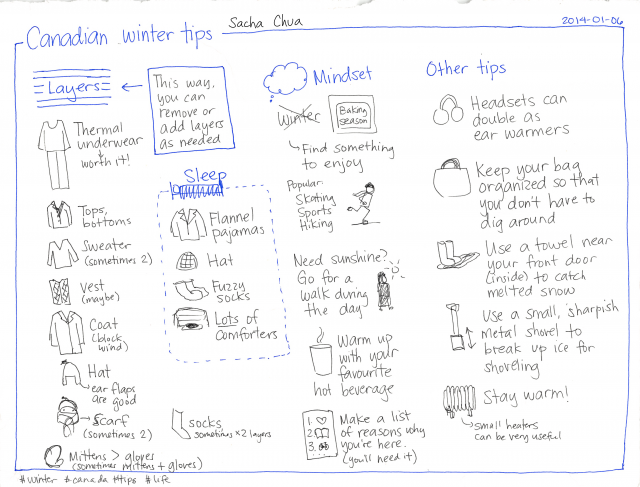 If you like this, you might like my 2009 blog post with some more notes on what makes winter better. Other winter notes: My insulated winter boots have sprung a leak. I still have a pair of leather boots and a pair of rubber boots (in bright red! ), so I think I’ll make it through this winter. I shopped around for a replacement pair this weekend and didn’t find anything I liked, despite the sales. I was thinking about whether I should get a pair for when these boots wear out, but I’ll probably move away from wearing insulated boots and move towards thick socks and hiking shoes or regular boots instead. It’s also a good time to see if I can repair the boots I have. Oh well! Inspired by my sister’s photo-assisted organization of her shoes, I decided to tackle my wardrobe. 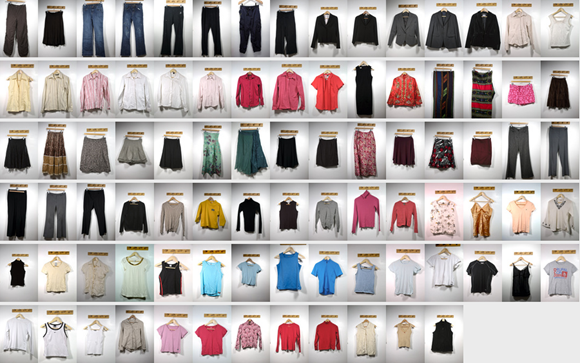 Taking an inventory would make it easier to simplify, replace, or supplement my clothes. Analyzing colour would help me substitute mathematics for a sense of style. Combining the images with the clothes log I’ve been keeping would make it easier to see patterns and maybe do some interesting visualizations. Geek time! 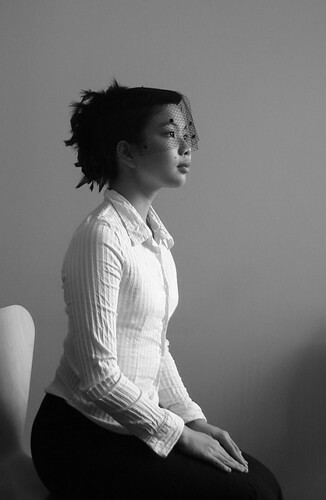 I took pictures of all my clothes against a convenient white wall. 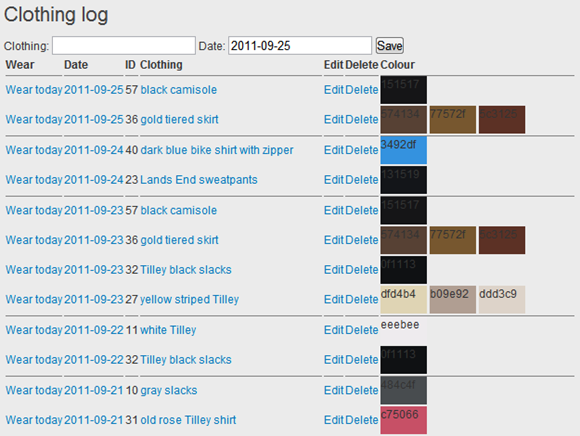 I corrected the images using Bibble 5 Pro and renamed the files to match my clothes-tracking database, creating new records as needed. AutoHotkey and Colorette made the task of choosing representative colours much less tedious than it would’ve been otherwise. After I created a spreadsheet of IDs, representative colours, and tags, I imported the data into my Rails-based personal dashboard, programming in new functionality along the way. (Emacs keyboard macros + Rails console = quick and easy data munging.) I used Acts as Taggable On for additional structure. It turns out that the math for complementary and triadic colour schemes is easy when you convert RGB to HSL (hue, saturation, lightness). I used the Color gem for my RGB-HSL conversions, then calculated the complementary and triadic colours by adding or subtracting degrees as needed (180 for complementary, +/- 120 for triadic). Matches are suggested based on tags, and are not yet sorted by colour. Sorting by colour or some kind of relevance factor would be extra cool. 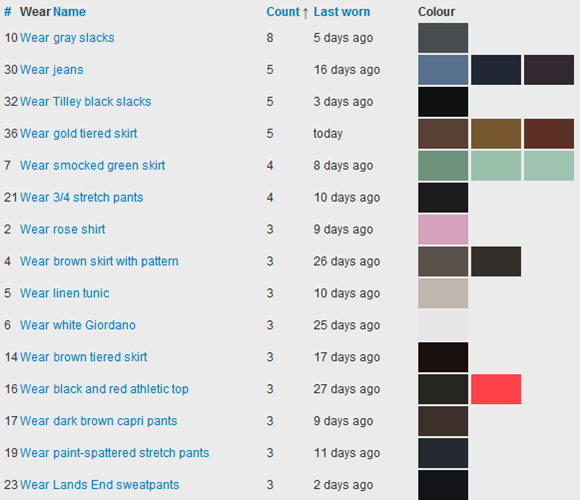 My colour combinations don’t quite agree with other color scheme calculators I’ve tried. They’re in the right neighbourhood, at least. Rounding errors? I’ll keep an eye out for accessories that match triadic colours for the clothes I most frequently wear. The dress arrived last week. It’s a simple ivory sheath of piña (pineapple fiber), with a lightly-beaded and embroidered panuelo (wrap). Although I’d never met the seamstress who made it, the dress fit like a charm, thanks to the measurements I’d sent. I had been planning to wear a dress a family friend had given me before, but my mom wouldn’t hear of it. She wanted to be involved in planning the wedding, so she volunteered to take care of the dress. It would be her gift, she said. I accepted, asking her to make sure it was simple, classic, and something I could wear again. This dress fits the bill perfectly. It would do just fine at a wedding and at a formal get-together or cultural celebration. In addition to this knee-length dress, she has also commissioned a Maria Clara, in case a long dress proves a better fit. My concession to the pageantry of weddings is to reach back in time and connect with my roots. I asked her to make sure the designer didn’t get carried away with modernizing the outfit. Traditional. Classic. A dress I can be buried in, I said. I was half-tempted to suggest an Ifugao outfit – our family has many memories of Banaue – but it seemed easier to find a seamstress to work on a beautiful Tagalog outfit than to (a) pick the right tribe, and (b) find an outfit that doesn’t scream “tourist souvenir”. Maria Claras and nice panuelos are non-mainstream enough to require a seamstress, but there’s plenty of wedding inspiration. The rich weaves and beading of the mountain tribes are more niche. And there’d be no question of W- matching my outfit – a g-string? in Canada? in October? At least W- has a barong, which he may or may not choose to wear. I love wearing Filipiniana, from the malongs I wear in summers to the colourful Ifugao belt I once repurposed as earwarmers in winter. I’d like to wear more of it, like the way I see men and women in ethnic outfits even at work. That might mean learning how to sew my own everyday versions, because the only baro’t saya I’ve seen in Philippine department stores are embellished with metallic threads or beads. The baro’t saya is close enough to regular wear for me to avoid having tons of conversations with strangers about whether I’m heading off to perform somewhere.